Hi, first of all, I would like to apologize you for disturbing on this. I am very new to machine learning and NLP field and I found that your example here are very useful for my practice as I can keep tracking my computation to see if I go correctly or not for a computing step. If possible, and not troubling you much, could you explain further about how can we calculate the backpropagation of Softmax function after we get an error? Again, I’m sorry for troubling you and would be very grateful if you could help me understand this til the end. Thank you. Backpropagation algorithm is pretty well known and it is a part of most packages for machine learning. Please check any book on machine learning to see details of backpropagation. Let me know if you still have a difficulty. Thanks for visiting my blog. I want to try to implement word2vec to Vietnamase language, but I’m confused about the pre-trained vectors, when I tried to use in the English language I use Google News-vectors-negative300.bin.gz (about 3.4GB) for pre-trained vectors and it works good. if i do with vietnam language should I make the data pre-trained vectors themselves ?? how to change a letter or word into the form above ?? You will need to create your own trained vector using an appropriate Vietnamese corpus. Take a look at the following post that might be useful: http://textminingonline.com/training-word2vec-model-on-english-wikipedia-by-gensim. I suggest you look at Tensorflow at the following link where both CBOW and skipgram models are used. Hi, may I know how did u calculate to get these values please? The prob. are calculated by taking the ratio of the output of every output node with the sum of all output nodes outputs. This is shown in the post just above the probability values via the use of softmax function. I tried to calculate the result softmax and got a different result. You are not performing exponentian. That is why you are getting different numbers as well positive and negative numbers. With exponentian as given in the formula in the post, all numbers will be positive and within 0-1.
very nice explanation of word2vec procedure 🙂 but still I cannot understand what is the final word representation vector? is it the vector of probabilities over dictionary? if not, than how one can extract the final result? The final word representation vectors are read from WI matrix at the end of the training. Each row gives a word vector. Thus, the i-th row will provide vector representation for the i-th word in the dictionary. But for this case you will get 3 values(probabilities) for each word. Do we need to add them ? If yes, then value in front of Climbed word should be high. is it ? Each output layer neuron gives one number. Softmax function converts these numbers to probabilities, one for each word. Here it stresses we should use 2 vectors to represent a word. I don’t know why we need to use this model until I see your post. The 2 vectors are actually hidden units and weight vectors from hidden unit to output layer. “That is, the network should show a high probability for “climbed” when “cat” is inputted to the network. ” this should be from the corpus, in another words, from training data. So it should be used to calculate the error? however i didnt see you use this to calculate the error. the whole procedure above should be the same if we dunt have the corpus but just a vocabulary with the eight words? thx and look fwd ur reply. can be updated using backpropagation.” Only thing is that I haven’t detailed this part of the process. I am Sivashankari. I am able to understand theory concepts. But I am unable to do the evaluation of my understanding level with any concrete example. Is there any solved example with the dataset( 10 sentences). I am not aware of any small example. I’d like to point out one thing about the figure in CBOW section which has possibility to mislead readers. You indicated many WI matric in the figure per one context word. The figure seems to describe there are different WI matric to be trained for each input word. However, WI is the final target matrix (word embeddings) which we ultimately want to get. 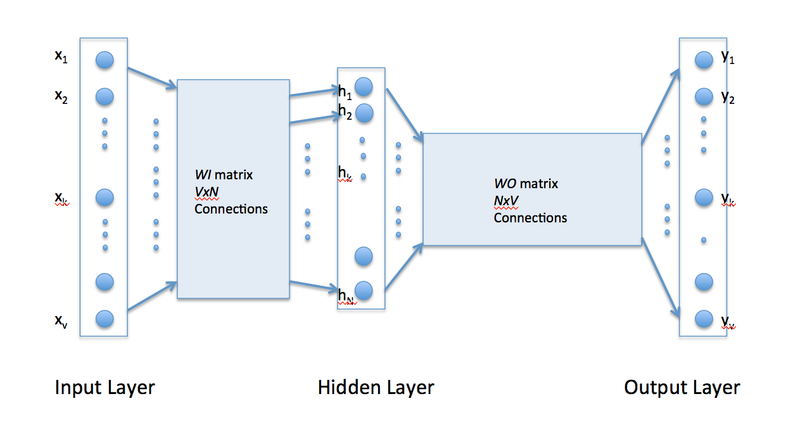 Strictly speaking it would be ONE WI matrix which is connected to many context word input vectors and many hidden layer neurons for better understanding. Please let me know if you have different opinions. Thanks for liking the article. All WI matrices are identical. There is no separate index to different matrices. 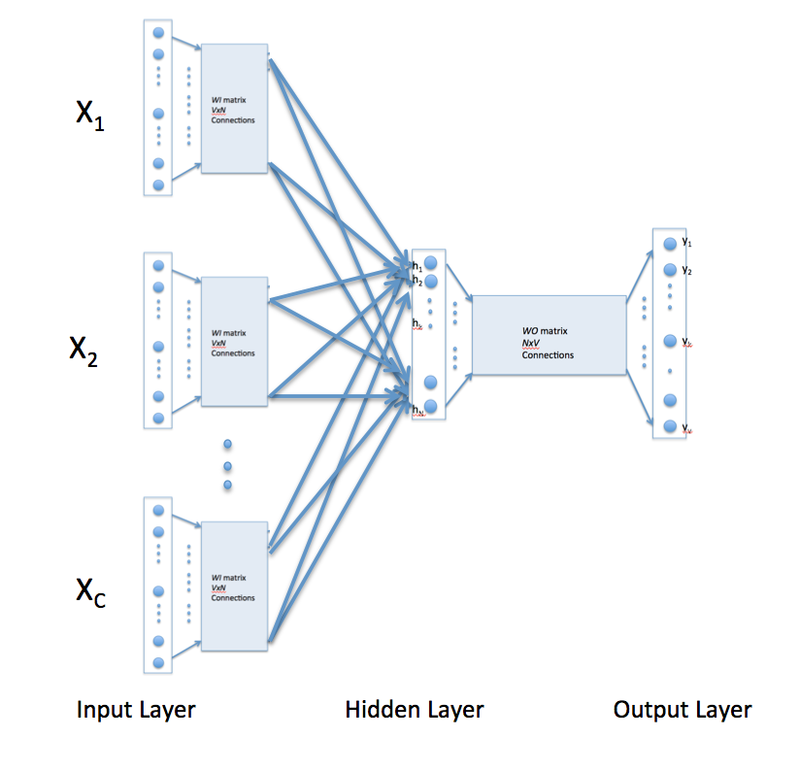 Also, the article states “The modification, shown below, consists of replicating the input to hidden layer connections C times, the number of context words, and adding a divide by C operation in the hidden layer neurons.”, which implies identical WI matrices. I am not talking about your knowledge or how correctly you understand the model. (Please Read the comment once again.) I am talking about the figure itself. As mentioned in the comment, the figure could mislead readers since you *implied identical WI matrices* in the article. I thought that this blog is for education/sharing purpose. If so, the article should provide knowledge as clear as possible for others. In terms of that, this article has a room for improvement. However, from your reply you are just saying that you know what I know. It’s your choice whether you improve the quality of article. Thanks. This is the best word2vec article that I have read! Can you please explain this step? Hidden layer output (H) is calculated earlier. The weight matrix W0 is known/defined earlier. So the output is simply a product between the transpose of the hidden layer output and W0. Please help how you get 8 words out of those 3 sentences. Did you take out the stop words.